-After giving up four goals on twenty shots through two periods, Canadiens goaltender Carey Price was pulled in favor of Peter Budaj. The 2014 gold medal winning goalie didn’t have a great day at the office, but his early exit was due to the series-ending knee injury he sustained in the 2nd period when Rangers winger Chris Kreider slid hard in to Price while driving to the net. While many Montreal fans felt this was a dirty play, it wasn’t. When a guy with Kreider’s size and speed is going hard to the net, gets slashed in the lower body by Alexei Emelin, and goes down with mere feet to spare before the crease, what else would you have liked him to do to avoid contact with Price? The Canadiens are now forced to start Budaj (10-8-3 / 2.51 GAA / .909 save percentage), with their AHL goalie Dustin Tokarski of the Hamilton Bulldogs (2-0 / 1.84 GAA / .946 save percentage in three NHL games this year), backing him up for the rest of the series. Budaj is 0-2 in seven playoff games (Montreal & Colorado) with a 5.10 GAA and a .843 save percentage (five of those games were mop-up work). 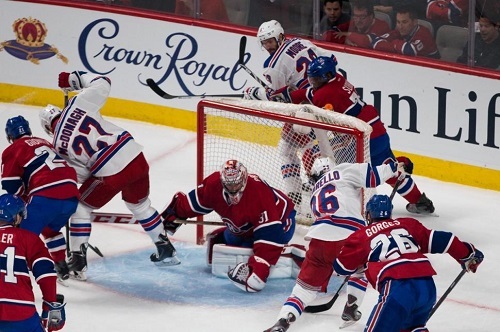 Chris Kreider crashes in to Canadiens Goalie Carey Price. Price is done for the Eastern Conference Finals with a knee injury as a result of this collision. -The young Rangers winger certainly stood out in Game 1 of the Eastern Conference Finals. Kreider was flying all over the ice, making plays, and had a goal (the eventual game-winner) and an assist. He’s provided a spark the top line of Nash and Derek Stepan, and he’s fresh after missing the first round and a half of the playoffs. There’s no doubt that he will receive some extra attention from the Canadiens tonight with the news of Carey Price being out for the rest of the series. Whether it leads to the Canadiens taking bad penalties or the Canadiens drawing the Rangers in to retaliatory penalties remains to be seen. Either way, they’ll have to catch the speedy winger first. Will Derick Brassard suit up for the Rangers? -Rangers Center Derick Brassard left Game One early in the 1st period after a hard, but clean hit by Canadiens Defenseman Mike Weaver. He received some treatment on his back before leaving the game for good. He’s listed as doubtful for Game Two. If he sits out, this would be a bit of a blow for the Rangers. The top six forwards seem to be gaining some momentum, but it’s been the third line of Brassard, Mats Zuccarello, and Benoit Pouliot that has been the most consistent offensively thus far in the playoffs. If Brassard doesn’t play, it looks like Dominic Moore would move up to center the third line (although Brian Boyle is also a candidate). Boyle would slide over to center fourth line between Derek Dorsett and one of the following; Jesper Fast, JT Miller or Dan Carcillo. Alex Galcheynuk could return to the Canadiens lineup as early as Game 2 on Monday night. Game Two could also see the return of Habs winger Alex Galcheynuk. The 20-year old has been out with a knee injury since an April 9th game against the Blackhawks. He had 31 points in 65 games for Montreal this season, and had three points in five games during the 2013 playoffs. When the young sniper does return, he’ll give Montreal some additional speed, and gives Michel Therrien some options with his line combinations. Game One featured a lot of north-south action on both sides, but I’d expect the pace of this game to be slower and more physical. If the series continues to be rush versus rush, the Rangers have the edge with their offensive talent (Nash, St. Louis, Brad Richards, etc). Expect a better performance from PK Subban, who was very quiet in Game One, despite an excellent playoff campaign thus far. Keeping their composure will also be of supreme importance for the Blueshirts. The Canadiens will want revenge for the loss of Price. But unless it’s an egregiously dirty shot at goalie Henrik Lundqvist, New York needs to be smart and let the Canadiens put themselves in the box with bad penalties. The Blueshirts have already achieved the first goal of a road team in any best-of-seven series by stealing home ice. As long as the Rangers aren’t on the receiving end of a drubbing in Game Two, they’ll be sitting pretty with a couple of days rest before Game Three on Thursday night.